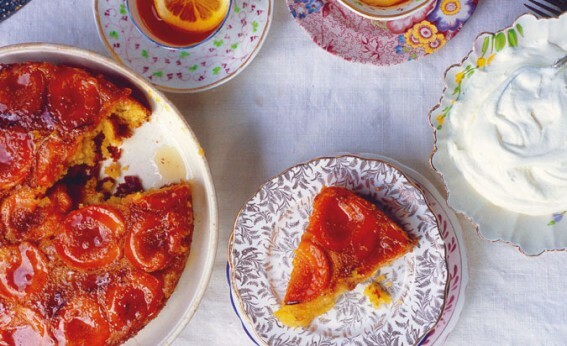 One of my favourite cakes, with a good balance of sweet and tart that really makes the best of apricots, especially those that are lacking in flavour or are underripe. Butter a 20–23cm (8–9in) cake tin and prepare the apricots. Put the sugar and 75ml (2 ½fl oz) water into a small saucepan. Heat slowly until the sugar has dissolved. When the sugar has completely melted bring to the boil and watch until the syrup starts to turn to caramel (it will turn golden first). Swish the pan a bit. Once it becomes caramel (you will know by the smell and colour) take immediately off the heat and add the butter. Stir once the butter has melted. Pour into the tin and place the apricots, close together and cut-side-down, on top. Preheat the oven to 180°C/350°F/gas mark 4. To make the cake, cream the butter and sugar until pale and fluffy, then add the eggs a little at a time, beating well after each addition (add a couple of spoonfuls of flour to the mixture if it starts to curdle). Sift together the flour and baking powder and stir in the almonds. Add the vanilla, then the dry ingredients, alternating with the milk. Spoon this batter over the apricots and bake for 50 minutes. When the cake is cooked, a skewer inserted into the centre should come out clean. Run a fine knife between the cake and the tin and invert on to a plate. If some apricots have stuck to the tin, carefully replace them on the cake. Gently heat the honey. Using a pastry brush or spoon, glaze the top of the cake. The honey will run down the sides to give a lush, homemade look. Leave to cool completely. The cake is lovely with crème fraîche (you can sweeten it slightly) or a mixture of sweetened Greek yogurt and double cream (no need to whip). Making this with plums: Red-fleshed ones are particularly good for their great colour, or try greengages. You will need to use more or less of these depending on the size of the fruit. If you use red-fleshed plums, make a glaze with melted redcurrant jelly mixed with a little water for a nice shine, instead of honey.